Bishop State Community College is a two-year, state-supported, comprehensive, coeducational college …. 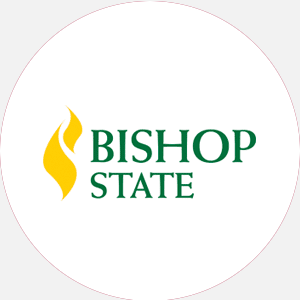 Bishop State Community College is a two-year, state-supported, comprehensive, coeducational college founded in 1927. Bishop State began as a branch of Alabama State University, called the Alabama State College Branch (Mobile Center). For several years it only provided extension courses for in-service teachers during the summer months. In September of 1936, the college was established as an all-year, two-year college. The college became a state junior college in 1965 and was officially named Mobile State Junior College. This move gave the institution its first independent legal status. The school was renamed S. D. Bishop State Junior College in 1971 to honor Dr. S. D. Bishop, the college’s first president. To more accurately reflect the growth and vocational offerings, the school became Bishop State Community College in 1989. As part of the Alabama College System, the state-supported network of two-year community, junior, and technical colleges, Bishop serves to provide high-quality educational opportunities to all residents of Alabama at an affordable cost. The main campus consists of six modern buildings situated on 9 acres. The two other campuses include Carver Campus, 414 Stanton Street, Mobile, Alabama 36617; and Southwest Campus, 925 Dauphin Isle Parkway, Mobile, Alabama 36605. Bishop State Community College is accredited by the Southern Association of Colleges and Schools (SACS) to award the Associate of Arts, Associate of Science, and Associate in Applied Science degrees. High school diploma(or equivalent), an official high school transcript, proof of recent physical, and proof of immunization against measles; men aged 18 to 26 must provide proof of registration with selective service. No application fee. Minimum of 96 quarter hours and completion of core requirements to include the following: 10 English, 15 science and mathematics, 10 social sciences, and 3 physical education. Campus Regulations: Class attendance required; cars must be registered; students must attend chapel. Campus Regulations: Class attendance required; cars must be registered; students must attend chapel. Campus Services: Health care, counseling, career planning and placement, child care, community service courses, remedial instruction, retention services, and chapel services. Campus Activities: Social and cultural activities include theater, chorale, concerts, band, and dance. The College Bowl, an academic quiz contest, is a highlight each year. Students may work on the Newsline (student-run newspaper), the Sword (yearbook), or Around Campus, which publishes activities, important events, and happenings concerning the campus community. August-June (quarter hours) One summer quarter. Associate of Arts: Art; Economics; English; History; Liberal Arts; Political Science; Psychology; Social Science; Sociology Associate of Science: Accounting, Art, Biology, Business, Business Administration, Business Education, Chemistry, Child Care, Computer and Information Science, Criminal Justice, Education, English, Mathematics, Music, Physical Education, Physics, Political Science, Pre-dentistry, Pre-law, Pre-professional Medicine, Respiratory Therapy, Science, Sociology, Speech, Teacher Aide Associate of Applied Science: Accounting Technician, Administrative Assistant/Secretarial Services, Biomedical Equipment Technology, Chemical Technology/Technician, Civil Engineering Technician, Computer Information Systems, Criminal Justice, Data Processing, Deaf Interpreter, Dietetic Technician, Drafting, Early Childhood Education, Emergency Medical Technology, Fire Services, Food Services Administration, Funeral Services and Mortuary Sciences, General Studies, Health Information Technology, Industrial Electronics Installer and Repairer, Instrumentation Technology/Technician, Library Technical Assistant, Medical Assistant, Medical Records Technician, Medical Technology, Multidisciplinary Studies, Nursing Assistant, Practical Nursing, Nursing (RN Training), Occupational Therapist, Office Management, Physical Therapist Assistant, Radiographer, Respiratory Therapy, Retail Operations, Waste Water Management.